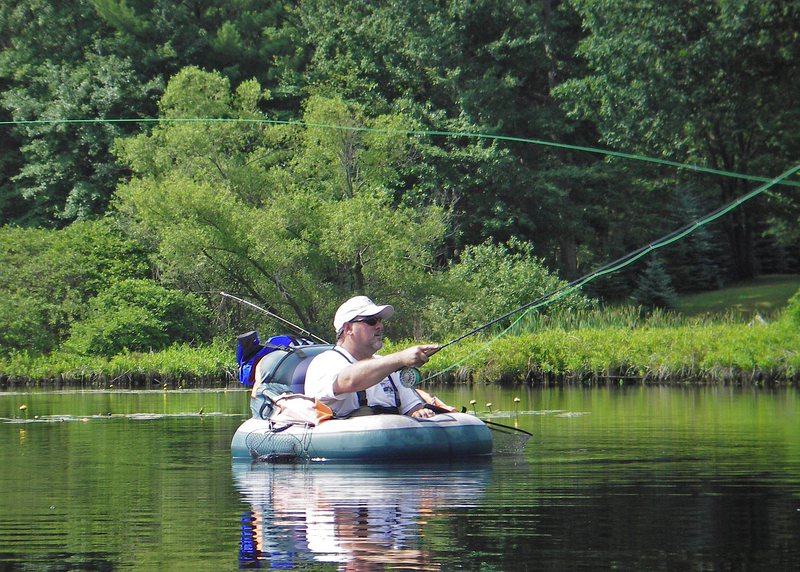 Float tubes are a great way to fish small ponds, lakes and easy flowing rivers. Photo: Howard Meyerson. Maybe you have an old float tube you are looking to get rid of, hoping to upgrade to a solo pontoon. Or, if this is even possible, you have just too many fly rods or are looking for a new bench vise but don’t want to shell out a lot of money. Fly anglers looking to offload gear that has stacked up over the years will be gathering at the Birch Run Expo Center, 11600 South Beyer Road, on March 21, for the first annual Fly Fishing Equipment Swap Meet / Garage Sale. The event runs from 10 a.m. to 3 p.m.. Admission for the general public is just $2. Kids 18 and under get in free. The meet is the brainchild of Jeff Johnson, a jeweler from Imlay City and the owner of Brookhaven Lake, in Farwell. Brookhaven is a private lake where Johnson offers guided opportunities to fish for giant Lake Nippigon brook trout and arctic grayling. “People always have stuff they want to get rid of. It’s only $10 a day to rent a table to sell your gear or promote your club,” Johnson says. The meet should be a great opportunity for people to mingle and buy sell and swap used fly fishing equipment. Johnson is hoping to make it an annual event. To reserve a table, contact Johnson at jeffjohnsonriverguide@yahoo.com or call him at 313-510-0928. This entry was posted in Uncategorized and tagged Fishing, Fly Fishing. Bookmark the permalink.